Tomorrow marks two weeks until Thanksgiving; any holiday that celebrates sharing amazing food with the people you love is a good thing in my book. Thanksgiving carries with it all the anticipation of a major championship game...the stakes are high and no one wants to disappoint the team on the big day. And, its easy to get wrapped up in planning for the main event... the potatoes, the veggies, the bread, and of course, the bird. Here's one game-day strategy for going from a bench-warmer to an All-Star in your house. Prep the team with easy-to-prepare appetizers. Sure, one of the best parts of Thanksgiving is the all-day anticipation of a huge dinner feast, but a warm-up round with tasty snacks is the best way to win big with your crowd. No need for a heavy appetizer display. Opt for flavor over quantity. With that in mind, I leave you with an 801 favorite... Marinated Olives. Prep a day or two in advance, and they'll taste even better. Enjoy. Combine all ingredients in a non-reactive bowl and allow to marinate overnight. Preheat your oven to 400 degrees. Peel away the white outer covering of the garlic bulb, leaving the cloves attached to the root. Cut across the top of the cloves so that you can see down into the bulb. Drizzle with olive oil and spread it around the entire bulb generously with your fingers. Wrap the bulb in aluminum foil and bake for 30-35 minutes or until the garlic cloves are soft. Remove the garlic packet from the oven and allow to cool. Remove the individual garlic cloves by gently squeezing the garlic bulb. 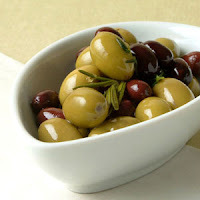 Toss the roasted garlic cloves with the olive mixture, or use it in a hummus mixture or marinade.